US singer Ariana Grande has done it, just like the Beatles 55 years ago. 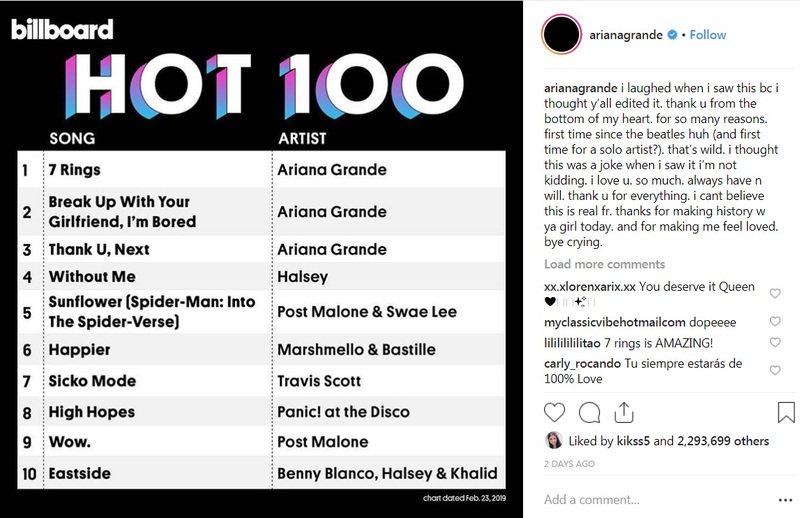 Ariana Grande is presently in first, second and third placings in the records classification, with three songs – ‘7 Rings’, ‘Break Up with your Girlfriend, I’m Bored’ and ‘Thank U, Next’. This record of three songs by the same artist in the first placings of the US Billboard Hot 100 classification had last been achieved in 1964, when The Beatles had ‘Can’t Buy Me Love’, ‘Twist and Shout’ and ‘Do You Want to Know a Secret?’ in similar placings. Grande has now managed to get her name included in the history of American music, and is the first ever soloist to achieve this success, which had only ever been achieved before by the Beatles. Grande wrote on social sites that at first she had not wanted to believe this, and thought it was a joke. She thanked all who supported her, saying that when she realised what she achieved, she cried with joy.